An article in the Sunday Times looks at the issue of waste in New York City through the lens of the take-out container at lunch. The facts following could probably be framed in another way too: the “Really? You can’t recycle this?” conversation that many of us have had with our well-meaning friends and family who throw everything plastic, paper or potentially-recyclable in the blue bin, trying to be a good samaritan. In other cities, that would fly. The Natural Resources Defense Council recently conducted a survey of 12 other American cities and found that they recycle many other types of plastics, while we really only do bottles and jugs. 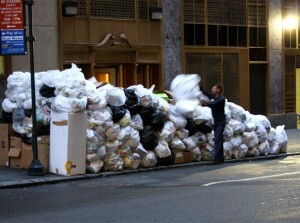 And in another survey by Siemens, New York came in 16th out of 27 cities on waste management practices. We recycle only 15% of our waste stream, which is down from our high of 21% (still not that impressive) in 2001. And the city is researching various pay-as-you-go systems that would charge people different rates on their waste, based on volume. As is usual, the reality of our sub-par recycling performance is a mix of behavior–New Yorkers allegedly only sort about half of what could actually be diverted from the landfill, bad communication–people are seriously confused about what can and cannot be recycled, and a lack of incentives and clear benefits to making changes.Public information is not going to be enough on this one. Sound familiar!? The discussion of composting toward the end of the article focuses specifically on businesses and their practices. But mentions nothing of the pilot projects to collect compostables at more farmers markets–which of course are wrought with problems. That stuff gets hauled pretty far to become nutrient rich “black gold.” I am personally curious as to whether that stuff has had any sort of impact on the overall waste stream. Check out where you can compost in your neighborhood by visiting the Greenmap Compost guide. And save your take out containers and compostable items for a week to see where you can do more.